After much debate about where to go next, we finally decided on Split, as we had a few days of overcast skies and rain that wasn’t any good for swimming. So off we went from Bol, around the top end of Brac and through the narrow channel that separates Brac from Solta and then onto Split. We saw a steady stream of charter boats coming out from Split after the weekend changeover – another reason for visiting Split mid-week as marina berths are 15% cheaper with all the charter boats away. We thought about pulling up to the city wall, which you can evidently use for free but it was quite crowded and with the weather changing we decided to check into the ACI Marina. Here, we managed a somewhat poor impersonation of someone who actually knew what they were doing vis-a-vis Mediterranean mooring. The problem arose when the marina guy insisted that we hook on our front line first, whereas our game plan was to hook on our back and pivot on that. Anyway despite that we did manage to get settled into our berth and quickly decided that bikes were the way to get around. Brad and Bec hired two and we dug out our fold up bikes from the front hatch. Then we went exploring. It took us a while to find the old city but we eventually got there and had a good wander. The old city is based around some wonderful Roman ruins, centred around a fortified Roman palace from about 300AD, built by a bloke called Diocletian, most of which is still standing today. After exploring the old city, we adjourned to one of the harbourside restaurants for a nice meal. Next day was a bike riding day. We decided to explore the wonderful national park, which is a hill called Marjan on the end of the peninsula where the city of Split is located. It is covered in a dense Mediterranean pine forest and is completely surrounded by the city and the sea, making it rather unique. 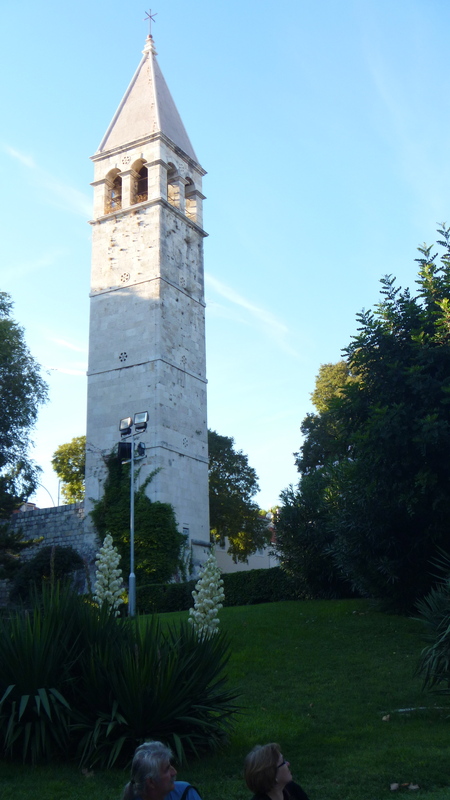 The good citizens of Split have used it as a park since the 3rd century, and has become a favorite weekend excursion destination and a recreational center for the city – a bigger version of Kings Park. It has some lovely little beaches, all surrounded by the scenic forest. Brad and Bec had reasonable bikes so they took off up to the top of the 180m high hill where there was botanical gardens and the city’s zoo. The fold up bikes were more suited to the flat ride around the coast so I headed along the exquisite ring road that passed under a canopy of trees, calling in at quaint little beaches and coves along the way. Cas decided to give the park a miss and rode back from the entrance to check out the nice beach with a water polo stadium that we spotted on the way there. We got back to the boat just in time to witness a thunderstorm that bucketed down rain in all directions. That night we decided to do a bit of a pub crawl, starting with a Champagne Bar that we had spotted earlier in our stay. We caught the ferry from the marina across to the old town to find the Champagne Bar closed because it was no longer high season. Never mind, we found champagne close by and then found a restaurant bar doing wonderful food combined with wine tasting. Perfect. Next morning, with the weather clearing and a sunny day predicted we left Split heading for the Blue Lagoon, which we had originally spied on a tourist poster. This entry was posted in Croatia and tagged marjan, split by stull61. Bookmark the permalink.